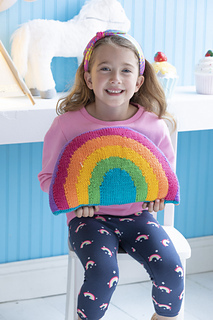 The front and back of this squishy rainbow are made separately, cast on at the lower edge and worked straight, before decreasing to form the arc. The back is solid-colored; the front is vertical stripes (intarsia with separate bobbins for each color). The pieces are sewn together and stuffed.